Escape from the world in this picturesque custom home. With its own private courtyard, soaring ceilings, Tuscan-textured walls and rich wood flooring, this home is truly an enchanting estate. Enter the gated, open-air courtyard with a cozy fireplace and plentiful space for entertaining. Indoors awaits an elegant living room with dramatic 17-foot ceilings, a floor-to-ceiling, stacked-stone surround fireplace, charming wood built-ins and mantlepiece, and newly refinished hardwood floors. A chef’s dream, the open kitchen stands out with upgraded 42-inch cabinetry, gleaming granite countertops, an impressive entertaining island with stylish pendant lighting, and high-end Kitchen Aid stainless steel appliances complete with a gas cooktop, custom-covered range hood and a wall-mounted oven. This kitchen truly comes alive with an exquisite stack-stone backsplash and a casual dining nook with large windows that offer a spectacular view of the serene backyard oasis. Opulence radiates from the master bedroom retreat, with attractive crown moulding, a cozy sitting area, a vast walk-in closet and a luxurious five-piece en suite with a deep soaking tub and his-and-her sinks. Adorning all bathrooms in this home are polished slab granite countertops, oil-rubbed bronze finishes and travertine flooring. Just down the hall, find a secluded bedroom perfect as a main-floor study, with a sophisticated wood coffered ceiling, built-ins, a spa-like en suite bath and direct access to the courtyard. Also on the main floor are one additional spacious bedroom with en suite bath and the laundry room complete with built-in cabinetry, a slab-granite countertop and a utility sink. Discover luxury just walking downstairs on the artfully-railed stairs. Two fully conforming bedrooms, adjoined by an elegant Jack-and-Jill bath, make the basement a lavish place for guests to stay. The basement extends into an expansive recreation room with huge lit windows and a trey ceiling, built-in bookshelves, multiple nooks and a half bath. The wet bar sits against an upscale stacked-stone wall and is well-lit with glimmering pendant lighting. Also in the basement are two huge unfinished spaces, perfect for home projects! Entertain in style, with the handsome courtyard in the front and a lush, ultra-private backyard. Boasting an expansive covered patio, a border of towering trees, immaculate gardens and a healthy lawn, this meticulously landscaped yard is a true haven! 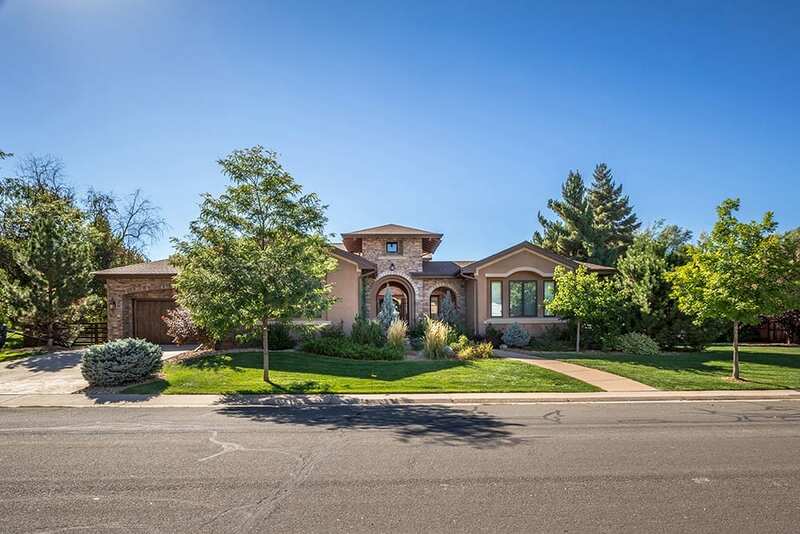 While this property feels like a secluded escape, it is ideally located next to the High Line Canal Trail, Cherry Hills Marketplace, with easy access to I-25 and the Denver Tech Center! Residents are well-served by the award-winning Littleton public school district.